Who would have thought that a natural food supermarket could have offered a financial refuge from the dot-com bust? But it had. Sales of organic food had shot up about 20 percent per year since 1990, reaching $11 billion by 2003 . . . Whole Foods managed to sidestep that fray by focusing on, well, people like me. Organic food has become a juggernaut in an otherwise sluggish food industry, growing at 20 percent a year as products like organic ketchup and corn chips vie for shelf space with conventional comestibles. But what is organic food? Is it really better for you? Where did it come from, and why are so many of us buying it? Business writer Samuel Fromartz set out to get the story behind this surprising success after he noticed that his own food choices were changing with the times. 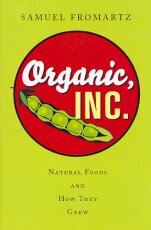 In Organic, Inc., Fromartz traces organic food back to its anti-industrial origins more than a century ago. Then he follows it forward again, casting a spotlight on the innovators who created an alternative way of producing food that took root and grew beyond their wildest expectations. In the process he captures how the industry came to risk betraying the very ideals that drove its success, in a classically complex case of free-market triumph.